This post is from Dublin, where I landed on Sunday morning. During the flight, somewhere over Nova Scotia on Saturday night, came the moment that I passed one million paid miles flown on United Airlines and its predecessors. That’s a lot of flying, and much of it had to do with color, so it’s appropriate to share some thoughts. I began to fly to Europe regularly in the early 1970s, sometimes for pleasure, sometimes with business mixed in. My job, fortunately, had a long summer vacation. In the 1980s, I didn’t have as many vacation days, but I did have to travel a lot on my company’s business. As I was one of the company’s technical gurus, I had to go to a lot of trade shows. E-mail, let alone Google, did not exist in that prehistoric era. The only practical way to keep up-to-date was by personal interaction. Many big convention cities in the U.S. are also interesting areas in their own right. When I would have to go to New Orleans or San Francisco, for example, I would always take a few days vacation to enjoy them, given that my company had already paid the air fare. By the mid-1990s these shows were no longer so critically important. Fortunately, I had embarked on a new career, of traveling various places to teach people how to correct color. It started with the ACT classes offered by what is now Ledet Training, with whom my relationship has now lasted twenty years. By the end of the decade it had expanded to trips all over the U.S. and the world, to sites where companies needed to learn how to make pictures look better. I was not interested in working 52 weeks a year or anything close to it. In that overheated economy, more companies than I could accommodate were interested in hiring me. I decided go only to places worth visiting as destinations in themselves. I took work in glorious Guadalajara, Mexico, but turned it down in polluted, violent crime-ridden Mexico City. I made repeated trips to Walla Walla, Washington, in the heart of the wine country, but repeatedly refused gigs in–well, let’s not go there. I didn’t. And of course, whenever anyone from Europe called, my calendar mysteriously cleared time for it. The previous blog entry talked about how the world has adopted me. The million-mile marker is an indication of how I have adopted the world. I am not very conversant with Asia, the Middle East, Oceania, and Africa. As against that, I started these trips right at about the time that flights to Europe became affordable, so older people wouldn’t have much of advantage, and they might not have been working at the time of the rapid development of technology. Anyone younger than me hasn’t had enough time to match my itineraries. People who speak as many languages as I do are somewhat rare, and those who can boast friends to guide them in almost every country are even rarer. So I’m dubious that anybody can match the breadth of my experience in respect to Western Europe and its former colonies. Much of this was luck, Many things had to come together to make the experience possible. But at least it was possible, which is more than I believe to be the case today. I had no money when I entered university, so everything since then, I’ve earned myself. From about 1980 to 2000, roughly, the economy was such that I could create havoc at any company I worked for, or in extremis, simply tell management to go take a flying leap, and move to someplace more to my liking. I don’t think such an attitude is possible for people in today’s economy. So I don’t think the opportunity that I had exists any more, which is quite saddening. In fact, it’s sad to watch younger tourists, because, other than retirees, none of them have enough time. Too many Americans, for example, try to do Italy in one week. They insist that in that time, they will see Venice, Florence, and Rome, with perhaps a side trip into Chianti. This gets them nothing more than a lot of travel (and recovery from travel) time plus a few notches on their belt. Yes, they can tell their friends that they have been to a certain place, but they would have been much better off sticking with one city for a full week. Allowing just one day for each of these incredible locations–well, you might as well do virtual tours on the web. The same goes, to a lesser extent, to my European friends who travel to my country. On the one hand the Europeans have more vacation time than Americans do. On the other, the United States is an enormous country. Far better to explore a certain region of it than to attempt to hit the high points of the whole thing. Although I’ve never been in Ireland in a realistic way, technically I’ve visited it a dozen times or so. When I first started accumulating these miles, most westbound flights across the Atlantic had to stop at the Shannon airport to refuel. The airport pubs were not quite as hospitable as the ones here in Dublin. Eastbound planes once all had to stop at Gander, in Newfoundland, for refueling. But as eastbound travel is with the wind and westbound against it, Gander lost its transatlantic business before Shannon, and before I ever got to visit it. Gander became more than a bookmark in history in the aftermath of 9/11. With U.S. airspace closed, returning flights were diverted to Canada, which doesn’t have enough large airports to accommodate them. Except in an airport that does little business today, but is big enough to have accommodated every transatlantic flight half a century ago. 38 U.S.-bound planes landed there, stranding 6,500 people–more than the entire population of Gander. In a great act of humanitarianism, the residents took the refugees into their homes for several days until flights to the U.S. could be arranged. Next June, I’ll actually get to see Gander, as well as the rest of Newfoundland, on my first-ever trip there. It’s scheduled for four weeks. There is still more or the world to see than I will have time to see it in, but I will take the advice I now offer you, and travel as much as I can, because I’m not sure about this planet’s future any more than I am about my own. I do not anticipate reaching two million miles, but I do anticipate continuing to enjoy the world, and I wish others the same. It’s only right to recognize the group of committed people who arranged my classes and seminars in these countries. I salute Alessandro Bernardi (Italy); Michael Cervantes (Puerto Rico); Jane England (Canada); Carlos Garro (Costa Rica); Laura Guzmán (Mexico); Timo Kirves (Finland); Sterling Ledet (U.S.); Andrés Pérez (Ecuador); Valery Pogorely (Russian Federation); José Rivera (Spain); Daniel Rubinstein (U.K.); Eduardo Ruiz (Peru); and Werner Tschan (Switzerland). I thank my wife and travel companion, Cathy, and those of you who have made me welcome wherever the million miles took me. Hi, Dan. Just a note to let you know that I was able to access the links to the resources and videos. Thanks for your concern and added helpful tips. 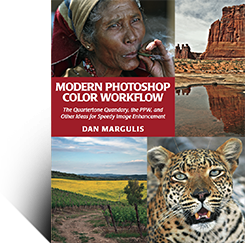 Always enjoy your books for the valuable theory behind color correction by the numbers as well as knowing what colors are and are not acceptable. This valuable info, makes it easier to get the best results for aesthetically pleasing color and contrast.